Brad Mckay says Caley Thistle players benefit from John Robertson's trust. Some managers rule by fear but Inverness Caley Thistle defender Brad Mckay reckons John Robertson rules by trust. Mckay has played under a broad variety of managers in club spells at Hearts, St Johnstone, Caley Thistle and several loan clubs. Some have resorted to the hairdryer treatment or a hard disciplinary line, but Mckay believes former Hearts striker Robertson’s subtler brand of man-management is bringing the best out in him and his team-mates. 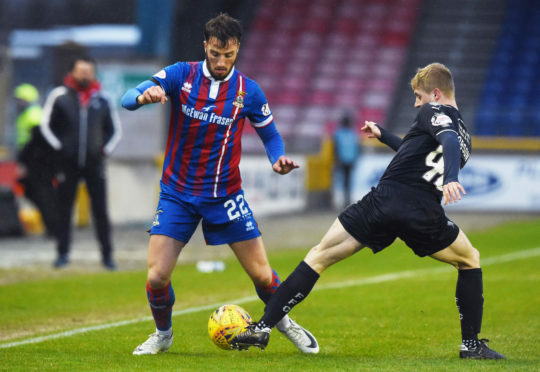 The 25-year-old, preparing for a crucial home test against Raith Rovers tonight in Inverness, said: “If you’re at a big club, it is the fans that push you on, home and away. They’re the ones who put the pressure on you to do well. “At smaller clubs, sometimes you have a manager who puts the fear factor into you and you don’t want to let him or your team-mates down. The manager here doesn’t put the fear factor in you, he puts trust in you. He’ll fully back you. “That’s when you go on the park really not wanting to let him down because he shows that trust in the players. He’s very relaxed. He is happy-go-lucky. But the main thing for me is he trusts me and every week I go out I don’t want to let him down. Group victories over Cove Rangers and Cowdenbeath have set Caley Thistle on course for qualification for the knock-out stages of the League Cup. Mckay believes momentum built towards the close of last season has fuelled the positive start from a squad featuring only a small handful of new arrivals this summer. But the ex-Hearts and Scotland under-21 defender believes the Highlanders have to be prepared for their toughest examination so far with the visit of the Kirkcaldy side. He said: “It is a game, obviously, we’re looking to win. We’ve a big chance if we can beat Raith and go top of the group, going into Sunday’s game down at Hearts. “If we then pick up a point there, we definitely secure top spot. Raith are well-organised, difficult to beat, difficult to break down. I watched them against Hearts and when a team sits in like that they can be hard to beat. “But we’ve made a good start and it is a case of continuing it. The gaffer is always on at us about training the way we play, which is a cliché, but true. The tempo of training since we’ve been back has been excellent, including the boys not playing at the moment but trying to get into the team.